I had a marvellous day at the NEC, Birmingham this past weekend. I travelled down on the Saturday, did the Fair on Sunday and came back on the Monday with a bag full of goodies. There hasn't been much progress with The Tenement recently as I've been searching for a very specific cabinet and luckily I found just what I was looking for at the Fair - which was just as well as I'd searched every where else! This will be given a bit of a bash and placed in the Little Chamber. It also means that that room will then be finished. The William & Mary chair is also for there as are the little picture frames and the flowers. 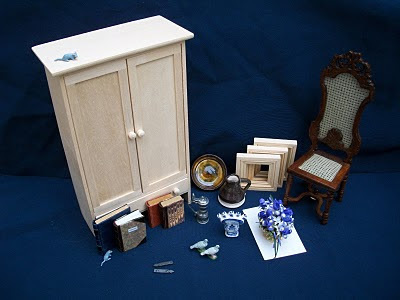 Other items in the picture are books and ledgers for the cabinet (there's a story to accompany that but I'll tell it when I post the relevant picture), the two pottery items will go in the Kitchen along with the Tappit Hen (a Scottish pewter drinking vessel. The name means "crested hen" and refers to the distinctive form of the lid). The blue and white tulip vase is for one of the other rooms yet to be started but I just had to have it there and then when I spotted it. Irene, I love everything you've bought. Is the W and M chair by Masters Miniatures? I adore their work -- so reasonably-priced, too. The cabinet is gorgeous, and so is the tulip vase :) Sounds like you had a great time in Birmingham! You've found some wonderful minis here, Irene. I'm looking forward to seeing them in situ! Hello Irene, I am moved to say hello, how are you? I hope so! your purchases are very convenient, because the cabinet has a style suitable for any room, and I like that! But I see two pretty blue mice! where thou shalt put them? are very nice! ah ha! Thanks for passing by my blog and leave loving comments! enjoy the rest of the Tenement house, I hope to see it finished soon! I am also here! Poor Irene: you're bored of seeing me in all your blogs! The books are fabulous, to tell the truth, whatever you've bought at the fair is fabulous! Beautiful purchases. I'm very glad you found the right cabinet for your room. It is a wonderful feeling when this happens and it is so wonderful to come back from a fair with a lot of goodies. I'm looking forward to seeing the progress in the tenement. Thanks everyone. I managed a bit of progress yesterday with The Tenement so pics will be forthcoming soon. Nina - Yes, the W & M chair is from Masters Miniatures. I'd known about it for a while as it's a very good match for the one in the original building. It looks very grand in situ too now! Caterina - the mice were from a German seller "Cinderella". She had some lovely minis and I've purchased from her in the past. The little mice will not be going in the next two rooms (as they're too grand) but further up as I've got a lawyer and a cobbler in residence - or they will be when I get there! What wonderful purchases. Love the books and the wardrobe/cupboard. What a great haul you got! Enjoy. 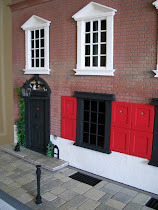 Love the idea of a tenement miniature - perhaps one day I will do a Glasgow one. Lived in one for most part of my life and can see it could be great fun - but for now on with Montgomery Hall!!! Basset Human Slave - Thanks for following my blog. I'm also a "Tenement Kid"!. Good luck with your MH. I've seen your stuff for real and it's all amazing. I love the gentlemen's razor and the brush set. Can't wait to see them in situ. Oh my...who made that tulip vase? I've been looking for a miniature one! I just found your blog and I am enchanted. I was lucky enough to visit Edinburgh last year and it's a fascinating city. Can't wait to see how the tenement turns out!